Welcoming the Easter Bunny will be easy this year. The weather is fantastic; the grass is already green and the colorful and vibrant spring flowers are flourishing. As a matter of fact, it was such a mild winter that we had a few lingering carrots in our garden. I believe that the Easter Bunny might just be lucky enough to find one or two carrots if he searches hard enough. I can just imagine the Easter Bunny enjoying the magnificent sight of all of the beautiful colors of springtime while hopping from house to house with his basket brimming with colorful eggs and sweet treats for the little girls and boys to find on Easter morning. To pay homage to that delightful, generous, and wonderful bunny I decided to bake carrot cupcakes because as everyone knows, a bunny’s favorite food is a carrot! Cream cheese frosting is a must for carrot cupcakes. 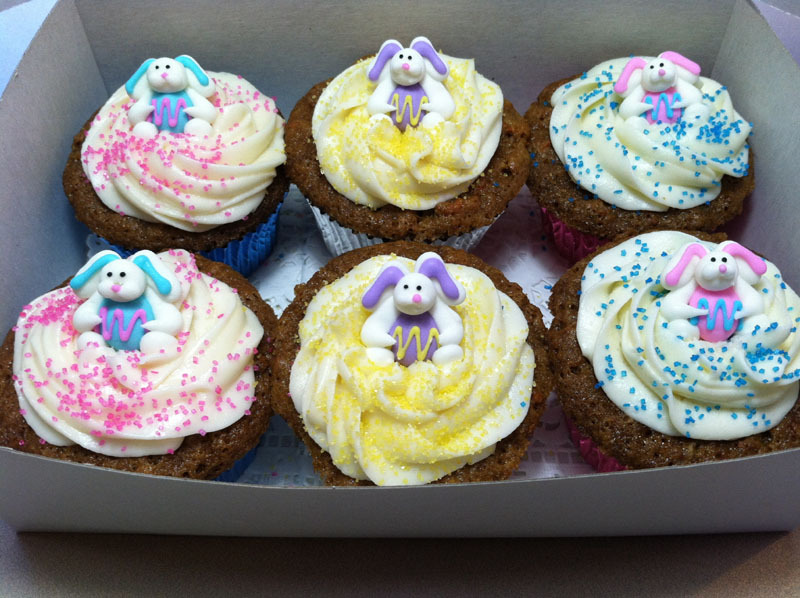 The cupcakes are adorned with colorful sugar crystal or sprinkles and decorator icing bunnies. These adorable cupcakes are sure to bring a smile to young children as well as those who are young at heart. Every baker has a favorite carrot cake recipe. Prepare your recipe and bake 24 cupcakes. Prepare your favorite cream cheese frosting and frost the tops of each cupcake. Add colorful sugar crystals or sprinkles and decorator icing bunnies. The same effect can be created with store bought carrot cupcakes by simply adding your own decorations to make them extra special.